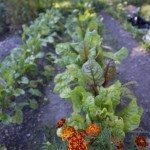 Kitchen gardens are nothing new, but we can revamp them and turn them into culinary staples specific to the cuisine and flavor profiles we love. There really is almost nothing better than the flavors of Italy, not to mention the tantalizing aromas of garlic, fennel and tomato cooking down into a decadent sauce over homemade pasta for Sunday night dinner. With this idea in mind, it might be a good idea to consider designing an Italian culinary garden around the cuisine you crave and love to eat. The breadth of Italian cuisine is broad and includes numerous exciting vegetables to plant in your Italian themed garden. And let’s not forget tomatoes! No Italian meal is complete without tomato whether eaten stewed, fresh, dried, or roasted. Plant this delicious fruit at the end of your garden away from the herbs so they can be watered and pampered separately. These herbs are adaptable and fairly drought tolerant and should be situated close to the kitchen or ease of use. Growing Italian herbs all have slightly different needs although most of them are hardy plants and require little attention. For instance, the flowers of basil plants should be pinched off to encourage a bushier plant and more leaf production. Rosemary, just as basil, may be sensitive to extreme cold temps and need to be covered in chillier climates. Either of these herbs may be planted in pots to allow for ease of movement when temperatures dip. Oregano tends to spread and may overtake the Italian herb garden, crowding out other plants. It can take the heat, but again, it may be wise to plant it in pots to keep it from competing with other herbs. Fennel doesn’t require much water and enjoys plenty of sun. Divide and replant this perennial every two to three years for maximum production and consume fennel within four days of harvesting lest it lose its flavor. Gourmet greens should be included when designing an Italian culinary garden. Among these you may decide to plant arugula, radicchio, romaine lettuce, and even some chicory to add zing to what may otherwise by an uninspired side salad. Throw in some edible flowers like nasturtium, pansy, borage, lavender and chives, which are not only aromatic but stimulate the eye as well as the taste buds.